Product prices and availability are accurate as of 2019-04-01 10:57:01 EDT and are subject to change. Any price and availability information displayed on http://www.amazon.com/ at the time of purchase will apply to the purchase of this product. Are you tired of having to slow down because you can't see what's hiding in the shadow ahead that might trip you up? Imagine going for a run in the dark and being stress free because you're not having to worry about what lies hidden in the path ahead. That's why we're introducing the ultimate headlamp specifically designed for you, the runner and outdoor enthusiast! Light up your path and set a new PR with this powerful 120 lumens bright headlamp. -Exclusive reflective headband helps you be seen, and adds distinctive styling! 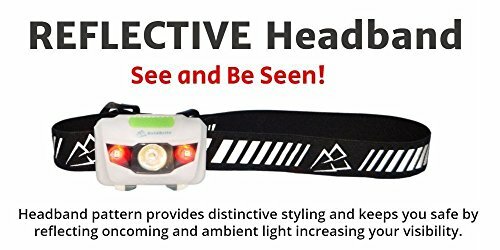 -Innovative engineering makes this headlamp so small it easily fits in your pocket, backpack, glove box, saddle bag... anywhere! 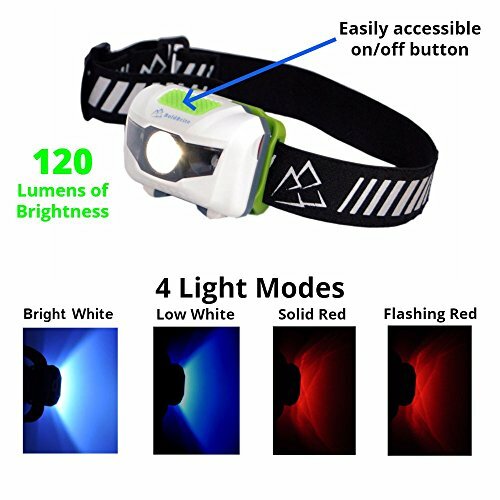 For a LIMITED TIME, we are offering the BoldBrite Headlamp at 50% off!!! This bargain will not last long! Never be in the dark again. Add to cart now! SUPER BRIGHT - 120 lumen super bright LED headlamp lights up your world. 4 SETTINGS - bright white, white, red, and strobe red. Perfect product for running, walking, hiking, trail running, biking, ragnar, camping, hunting, fishing, and biking. SO COMFORTABLE YOU'LL FORGET YOU'RE WEARING IT - Lightweight (2.4 oz) and compact design. Curved forehead panel for a comfortable fit. 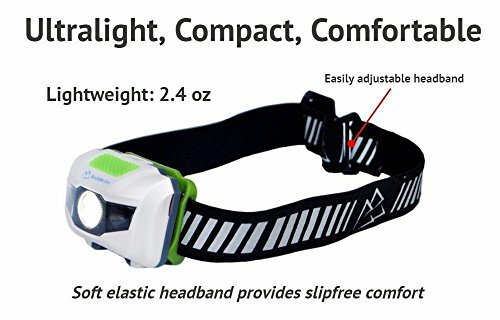 STYLISH and REFLECTIVE adjustable soft elastic strap will keep the headlamp comfortably in place no matter your activity. 45-degree tilt provides light where you need it without having to strain your neck. WATERPROOF AND DURABLE - Waterproof (IPX4 rating) hands-free flashlight headlamp that is ruggedly durable and shock resistant. Great for adults and kids, indoors and outdoors. Red light great for tents, reading in bed, and outdoor activities to preserve night vision. LONG LASTING BATTERY LIFE - 3 Included DURACELL AAAs will keep you going for weeks. Compare to the less than 5 hours of use you'll get from some competitors that are powered by a single AA battery. This product is ideal for runners, walkers, hikers, campers, hunters, and bikers. 100% SATISFACTION, MONEY-BACK GUARANTEE - We're confident you'll love your new BoldBrite headlamp. Try it and if you decide you don't love the ultimate in hands free outdoor adventure lighting, we will give you a full refund on your payment no questions asked! Limited time offer running today to save 50%. Don't miss out, ADD TO CART now.